Depression is an important prognostic factor in low back pain (LBP) that appears to be infrequent in chiropractic populations. Identification of depression in few patients would consequently implicate screening of many. It is therefore desirable to have brief screening tools for depression. The objective of this study was to investigate if one or two items from the Major Depression Inventory (MDI) could be a reasonable substitute for the complete scale. The MDI was completed by 925 patients consulting a chiropractor due to a new episode of LBP. Outcome measures were LBP intensity and activity limitation at 3-months and 12-months follow-up. Single items on the MDI that correlated strongest and explained most variance in the total score were tested for associations with outcome. Finally, the predictive capacity was compared between the total scale and the items that showed the strongest associations with outcome measures. In this cohort 9% had signs of depression. The total MDI was significantly associated with outcome but explained very little of the variance in outcome. Four single items performed comparable to the total scale as prognostic factors. Items 1 and 3 explained the most variance in all outcome measures, and their predictive accuracies in terms of area under the curve were at least as high as for the categorised complete scale. Baseline depression measured by the MDI was associated with a worse outcome in chiropractic patients with LBP. A single item (no. 1 or 3) was a reasonable substitute for the entire scale when screening for depression as a prognostic factor. Pain and depression often co-exist[1–3], and although the causal relation between the two is not clear[4, 5], evidence suggests that pain negatively affects outcome in depression as well as vice versa. Low back pain (LBP) is a highly frequent pain condition with a substantial impact on global health for which the risk of a poor prognosis is increased in the presence of depression[8, 9]. It is a condition for which there is no generally effective treatment, but non-pharmacological treatment addressing psychological symptoms in addition to the physical symptoms has been demonstrated to improve outcome in LBP patients with high scores on psychological questions. Chiropractors see a large number of LBP patients who appear to be a population with relatively low frequency of severe psychological distress[11–13]. Nevertheless, a substantial proportion with borderline depressive scores has been observed. Therefore, to improve care and to predict prognosis, it may be important to identify psychological factors, including depression, among those seeking care for LBP, also in chiropractic practice. For that purpose screening instruments generally perform better than clinical impressions[14, 15], and a number of questionnaires screening for depression exist. The Major Depression Inventory is thoroughly validated as a diagnostic screening instrument[17, 18] and has been shown to be feasible in chiropractic care. However, it is unknown if the MDI predicts outcome in chiropractic patients. Despite the potential implications for management and prognosis, routine screening for psychological factors is not widely implemented and has met some resistance from clinicians. One reason might be that the questionnaires are too extensive for routine clinical use where information on a variety of other prognostic factors is also relevant to collect. This is especially true in chiropractic practice where the subpopulation with depressive symptoms is small[11–13], and therefore the identification of these relatively rare cases involves screening of many for whom it has no relevance. If systematic screening for depression is to be implemented, there is a need for a very short and easily completed tool. Fair to good diagnostic accuracies of one- and two-item screening tools with full questionnaires for depression as reference standards have been demonstrated[21–23]. It is unknown whether observed variations are due to differences between screening questions or between screened populations, and it is possible that suitable screening questions differ between populations. Furthermore, the usefulness of brief screening questions for prediction of prognosis is unrevealed. The aim of this study was to investigate whether the MDI is predictive of outcome in chiropractic practice and if so, whether one or two items from the MDI could potentially be used as an ultra-short tool for capturing depressive symptoms in LBP patients seeking chiropractic care. To obtain that we tested whether the total MDI was associated with 3- and 12-months outcomes, explored which single items of the MDI correlated best with the total score, and compared the predictive capacity of these items to that of the total MDI. The study was incorporated in a previously described cohort study with data collection occurring at seventeen chiropractic clinics in the research network of the Nordic Institute for Chiropractic and Clinical Biomechanics in Denmark. Patients completed questionnaires in the reception area prior to the first consultation due to a new episode of LBP. Follow-up questionnaires were mailed after 3 and 12 months. Treatment was unaffected by study participation and the chiropractors were free to choose the treatment they found appropriate. It was confirmed by The Regional Scientific Ethical Committees for Southern Denmark that the study did not need ethics approval according to Danish rules. 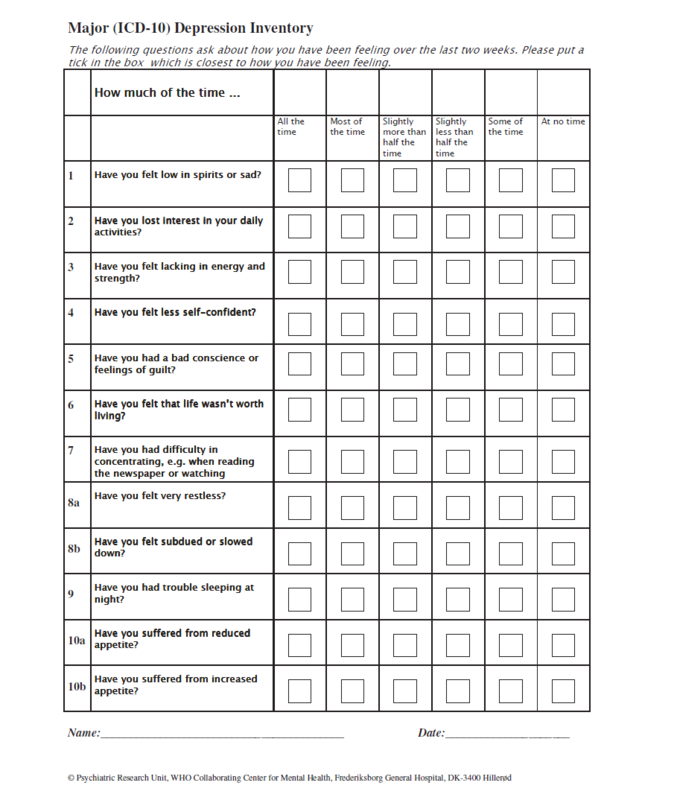 Depression was measured by the MDI consisting of twelve items answered by choosing one of 6 response options from ‘At no time’ (= 0) to ‘All the time’ (= 5) (Additional file1). When using the MDI as a depression rating scale ten of the twelve items are used for the total score. Only the highest score on the items 8a and 8b is included since these are considered opposites (feeling restless and feeling slowed down) and similarly only the highest score on items 10a and 10b (reduced appetite and increased appetite) is included. This results in a sum score ranging from 0 to 50 that are categorised into ‘no depression’ (score of 0 – 19), ‘mild depression’ (score of 20 – 24), ‘moderate depression’ (score of 25 – 29), and ‘severe depression’ (score of 30 – 50). At baseline, patients also responded to questions regarding LBP duration (0–2 weeks, 2–4 weeks, 1–3 months, >3 months), number of previous episodes (0, 1–3, >3), LBP intensity (Numeric rating scale (NRS) 0–10), leg pain intensity (NRS 0–10), and activity limitation (Roland Morris Disability Questionnaire (RMDQ) proportional score 0–100[27, 28]). Data were entered twice in EpiData. Analyses were performed in STATA/SE 12.1 (STATA Corp, College Station, Texas, USA). 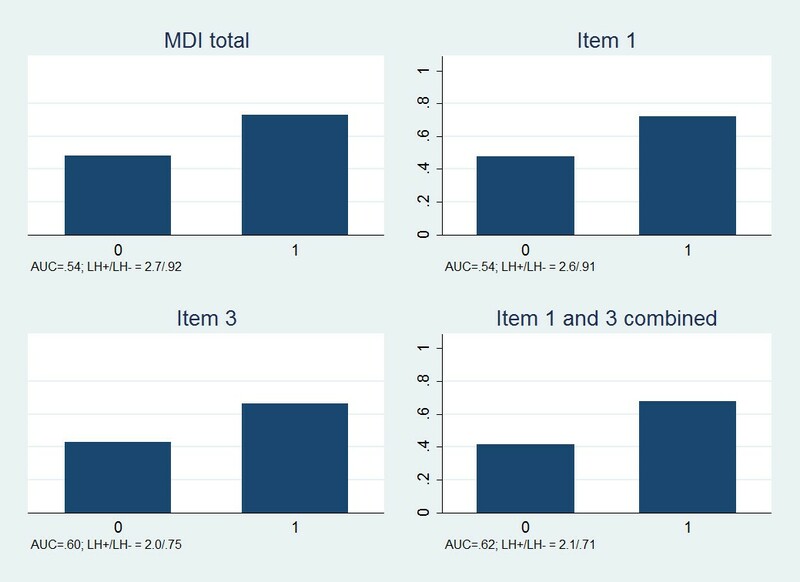 No imputations were made, and sixteen subjects (1.7%) were excluded from the analyses due to missing values on one or more MDI items. The identification of potential prognostic screening items was performed in two steps: (1) We identified the single items that best reflected the sum score of the scale by calculating the Spearman correlation between each item and the total score and the variance explained (R-squared) in a linear regression model with the MDI sum score as dependent variable and the single item as the independent variable. These were considered ‘candidate items’. (2) The associations between the candidate items and outcomes at 3-months and 12-months follow-up were then tested by means of linear regression, and the prognostic capacity was compared in terms of effect sizes (β-coefficients) and amount of variance in the outcome explained by the item (R-squared). Responses “Most of the time” and “All the time” were collapsed for this purpose due to few observations in these categories. To report more clinically interpretable results the predictive abilities of the two preferred candidates, quantified as area under the ROC curve (AUC) and likelihood ratios (LH+/LH-), were compared to that of the total MDI when predicting ‘persistent pain’ (LBP intensity > 0) and ‘persistent activity limitation’ (RMDQ >8% corresponding to >2 points on the 24-item RMDQ. For the total MDI, we considered all of mild, moderate, and severe depression as a positive test, since these categories were quite small. On the single items scores 2–5 were considered signs of depression based on ROC-curves and favouring a high sensitivity. Each single item was tested by itself, and the two best screening questions were combined defining a patient as depressed if scoring 2–5 on any of the two questions. The study cohort consisted of 925 patients (45% females, mean age 43 years) who had completed the MDI. Those excluded because of missing MDI items were 3.6 years older than participants, more often females, and their LBP had less frequently lasted for more than 4 weeks. No differences were observed on LBP severity or on the completed MDI items. Follow-up was completed by 731 (79%) and 684 (74%) after 3 and 12 months, respectively. Non-responders were more often males, were on average 5 years younger, and had slightly higher MDI scores (1.5 points) than those participating in follow-up. Patient characteristics are summarised in Table 1. *p-value for test of no difference between ‘no depression’ and ‘mild to severe depression’ the duration of LBP categories for non-depressed sum to 101% due to rounding of figures. The categorised MDI had statistically significant associations with LBP intensity and activity limitation at 3-months and 12-months follow-up (all p < .05). However, the effects, especially regarding pain outcomes, were small, and the amount of variance in the outcome explained by MDI was very low (Table 2). *All associations between items and outcomes and total MDI and outcomes were statistically significant (p < .05) except for the association between item 8 and LBP at 12-months. Confidence intervals that span across zero indicate that this particular category was not significantly different from the reference. 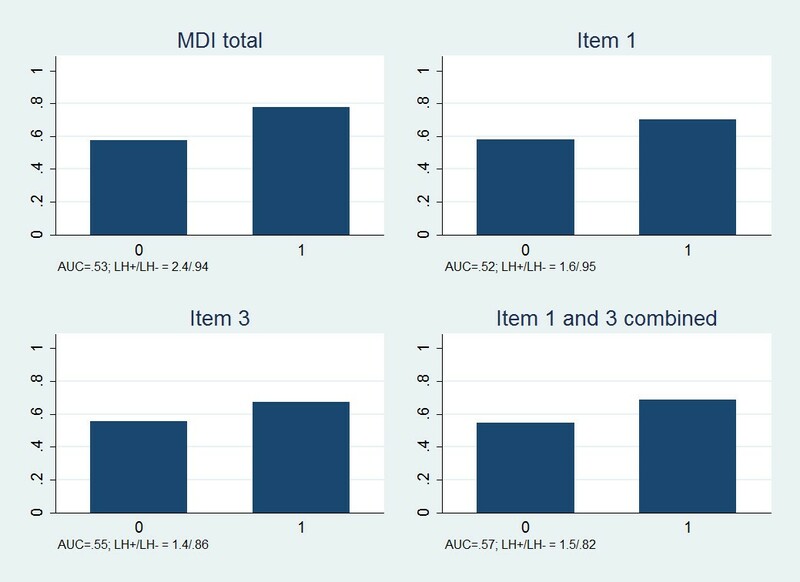 Correlation coefficients between single items and the full MDI and the variance explained in total MDI by each item appear from Table 3. Items 2 (Have you lost interest in your daily activities? ), 3 (Have you felt lacking energy and strength? ), and 8 (Have you felt restless/Have you felt subdued or slowed down?) were considered candidates for brief screening questions based on the correlation coefficients, and in addition item 1 (Have you felt low in spirits or sad?) and item 4 (Have you felt less self-confident) were included in the analyses of prognostic capacity because they had R-squared values equal to that of item 8. All correlations and regression models were statistically significant (p < .001). All candidate items were significantly associated with the outcome measures except for item 8 in relation to LBP intensity at 12-months (Table 2). Effect sizes were comparable to those of the categorised total MDI, and, as for the total scale, little of the variance in the outcomes was explained. For all outcome measures items 1 and 3 explained the most variance and were considered the best choices as brief screening questions although not performing pronouncedly better than other candidate questions. Patients with signs of depression had more frequently persistent pain at 3-months follow-up regardless of whether the definition of depression was based on the total MDI, item 1, item 3, or items 1 and 3 combined (Figure 1). However, the predictive accuracy of depression was low with all definitions (AUC: 0.52 to 0.57). A slight increase in the predictive accuracy was gained by combining items 1 and 3 as compared to using only one of them. The positive likelihood ratio, i.e. the increase in risk of a poor prognosis associated with depression, was higher for the total MDI scale than for single items, whereas a combination of items 1 and 3 performed best regarding the negative likelihood ratio, i.e. identification of those with reduced risk of a poor prognosis. Proportion of patients with persistent pain at 3-months follow-up in depressed (1) and non-depressed (0) according to four ways of screening. AUC = Area under the curve. LH + = Positive likelihood ratio. LH- = Negative likelihood ratio. Proportion of patients with persistent activity limitations at 3-months follow-up in depressed (1) and non-depressed (0) according to four ways of screening. AUC = Area under the curve. LH + = Positive likelihood ratio. LH- = Negative likelihood ratio. Predictions of 12-months outcomes were very similar to those of 3-months outcome and are not reported. As in previous studies[11–13] depression was not frequent in this cohort of patients seeking chiropractic care for LBP. Therefore it was not surprising that depression on its own did not predict outcome with any certainty given that a high number of factors appear to influence the course of LBP. One previous study investigating depression as a prognostic factor in chiropractic patients with LBP used the Hospital Anxiety and Depression Scale and found that depression was associated with outcome but not an independent predictor. It was not within the scope of this paper to investigate whether MDI scores were independently associated with outcome. Moreover, it was not investigated if cognitive elements were included in treatment for patients with signs of depression which may reduce the predictive value of depression. A recent study demonstrated substantial overlap between depression and pain-related psychological factors such as anxiety, self-efficacy, and kinesiophobia, and the combined construct of pain-related emotional distress was an important indicator of risk of poor prognosis in patients from general practice. To examine complex psychological constructs in large clinical cohorts, simple ways of collecting information on each element are essential. A 2-item screening test for depression taken from the Primary Care Evaluation of Mental Disorders Procedure (PRIME-MD) has previously been recommended for physical therapist treating LBP. The PRIME-MD questions “During the past month, have you often been bothered by feeling down, depressed, or hopeless?” and “During the past month, have you often been bothered by little interest or pleasure in doing things?” reflects the same aspects of depression as MDI items 1 and 2. However, our results indicated that in the investigated setting, item 3 should be preferred to item 2. This was likely due to item 3 having high scores considerably more frequently than item 2 in our cohort. Also 1-item questions simply asking if patients feel depressed, or to what extent they have felt depressed during the last month, appear useful for diagnostic screening. However, none of these questions were tested as prognostic factors and future research in this area should provide direct comparisons of existing brief screening questions.